A Scene From Danny's Lifelong Appreciation of Vincent Price: My friend Gin reminded me of this classic Simpsons scene. This episode is over a decade old, but this scene still just slays me. 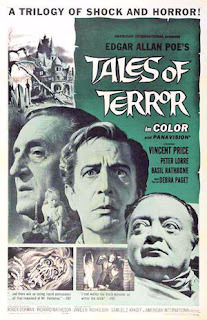 The final movie in our Price is Right block is Tales of Terror, another anthology piece, this time with three Edgar Allen Poe adaptations. The Masque of the Red Death was a winner, so I had high hopes for this one, especially after a couple of mild disappointments this week. I lucked out! I'm still looking forward to some movies with a little bit more punch, but this was a nice one to finish the block with. Each of the three stories in the movie features Vincent Price, with some fantastic supporting cast around him. I thought I'd read most of Poe's work, but the very first story was one that I wasn't at all familiar with, "Morella." (I'm always kind of torn when I describe plots, because I want to share with you about what I watched, but I also don't want to spoil it for you. Especially in this case, where it would spoil both the story and the movie. But I'm going to justify it [like I did yesterday] by pointing out that both of these works are REALLY OLD.) Price plays a widower who lives alone and has little contact with anybody until the day that his estranged daughter appears in his home. At first, he wants her to leave, until he learns that she is dying. He opens his home to her and they repair their relationship, but she soon learns why he has never stopped mourning his wife's death, and what is in store for her. There was a makeup effect in this part of the movie that really worked well, which I always love to see. In the era before advanced VFX, it's cool to see what they were still able to do. I also liked the story enough that I went and read the actual story a few minutes ago. The movie's a little different, but not so much that it loses the story. BOOKS! They're like movies for your MIND! The second section was my favorite, an adaptation of "The Cask of Amontillado." Everybody read this in high school English, right? If you didn't, go read it right now. For real. Peter Lorre plays Montresor, who seals his rival (Price) into the walls of his family wine cellar as revenge against him. The movie's take on the story is very darkly comic. The movie adds some details about the wrongs that Montresor suffers at his rival's hands, and adds an ending that I thought went against the creepy spirit of the story's ending, but Peter Lorre is just fantastic. The scene where he and Price challenge each other to a wine tasting contest is hilarious, as Lorre chugs his down, and Price exaggeratedly goes through the whole sniff, slurp, and swish oenophile routine. The third story is the most macabre, "The Facts in the Case of M. Valdemar." I'm actually not going to spoil this one, but only because it's a bit of a more obscure story, and I want to leave at least a little something for you to discover. It's about the nature of death and the mind, and how the two interact. My opinion? Not quite as great as Red Death, but still a worthwhile watch. I give it four wine casks out of five. Tomorrow night: We start our block of Cults & The Occult with Martha Marcy May Marlene. It'll be on the ATMax channel at 10 PM Central time.